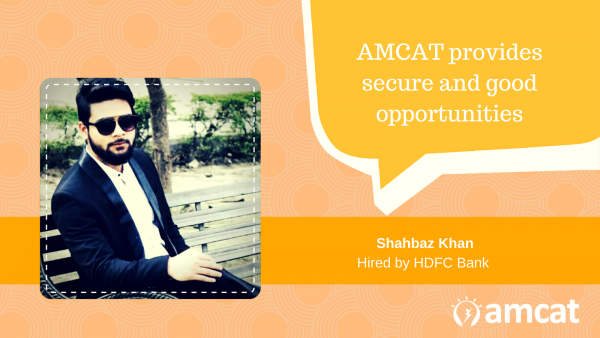 AMCAT helped Shahbaaz Khan get a job as a Virtual Relationship Manager in HDFC Bank. 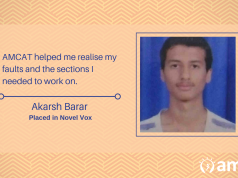 Read on to know his AMCAT Success story. I have completed my B.Tech in Electronics & Communication Engineering. My hobbies are acting, playing cricket and net surfing. I am looking for a stable and growing career. Shahbaz, quite satisfied with the AMCAT and his result says, “While looking for jobs, I found out that there were many fake job postings. As a result, I took the AMCAT test after my friend suggested for me to take it”. Shahbaz believes in self-learning prepared for the AMCAT himself. “I prepared online and my experience with the test was great. As it is an adaptive test, I had a smooth experience during the test. So, when I scored decent marks in the test, I expected a good number of interview calls”. Consequently, as he talks about his successful interview, Shahbaz says, “There was an aptitude test and a personal interview at the company. Since it is a reputed company, there were around 1000 candidates which included both, fresher and experienced. The aptitude test for the process was also conducted by AMCAT only. The interview went well. The interviewers asked me about my projects, job description and my knowledge about the company. It was more like an MR interview. They gave me a situation and asked for the solution”. 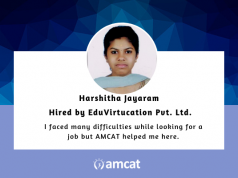 “Yes, I would definitely recommend the AMCAT to others, especially freshers. The reason is that it is difficult for a fresher to get genuine jobs. There are several fake job postings. In the end, I would say that AMCAT provides secure and good opportunities to the job seekers in start-ups as well as MNCs”. “Go through indiabix.com for quantitative and analytical tests and follow some books like R.S. Agarwal or M.Tyra. For Computer Science and programming: go through OOPS concept, basic data structure, basics of DBMS and COA. Also, for the English section read the passage very carefully and only then answer. Don’t waste the time on a single question if you are not able to solve that. Inspired much? Tell us your job search experience. 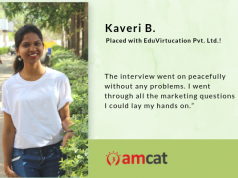 For more updates on the AMCAT, success tips and employability news, stay tuned.